I love making side dishes that are more like a main dish. Or maybe I just make such big side dishes that there is no need for a main dish. Either way, my sides are full of veggies and a different kind of seasoning every time. 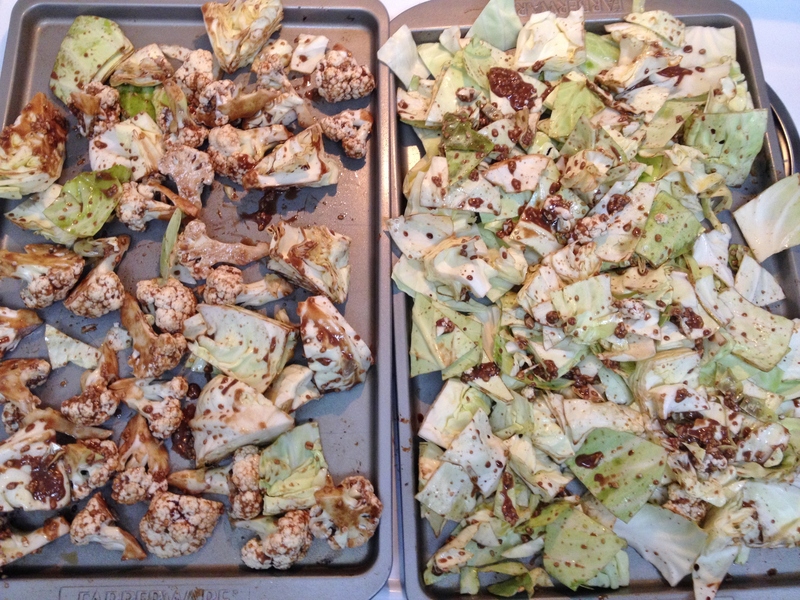 Here is some Balsamic and Dijon Roasted Cabbage and Cauliflower. On the weekends I usually make my week-long meals on Sunday morning so I have my lunch ready and then the rest of the day to do nothing but relax. So Saturday is the day I need something healthy, especially since it is also my tougher workout day. I love making a large meal that I can munch on for a few hours. This may sound strange, but I can make a meal and start eating it at 1pm and then get so lost in the internet or a movie or tv show, that I will forget about the food and then remember it an hour later. And yes, I will usually eat it cold too. 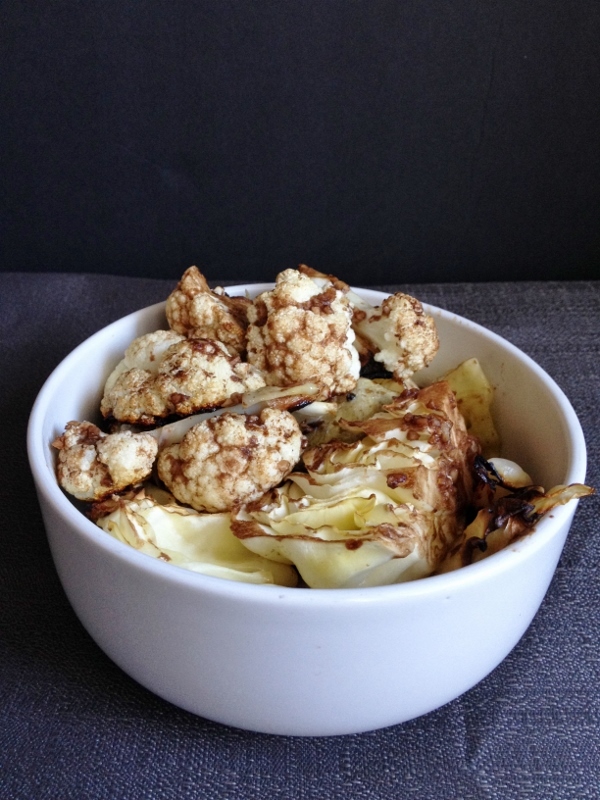 I am a lover of all things cauliflower and it was on a super sale at the store, and I have been eating more cabbage lately but wanted a change with them both. 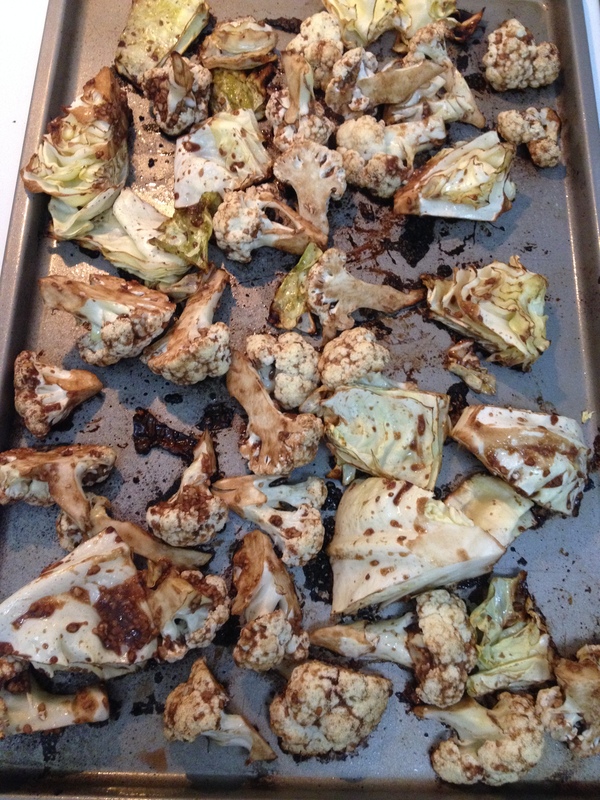 I have roasted cauliflower before but never cabbage, but I figured why not? It’s a veggie. The marinade is what I use on my salads and what I posted on for the Simple Tomato Avocado Salad and is so yummy and tangy that I knew it would taste good roasted. Normally I have large ziplock bags for this but I ran out, so a large bowl was it. I didn’t get a chance to mix it while it was marinating but it still turned out great. In the bottom of the bowl add dressing ingredients and mix. 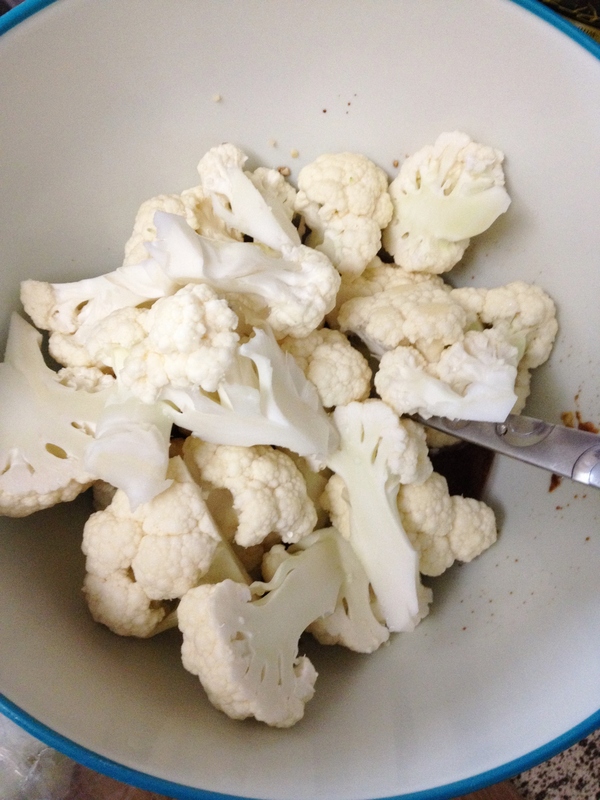 On cutting board carefully chop cauliflower into small florets and add to the bowl. Mix really well. 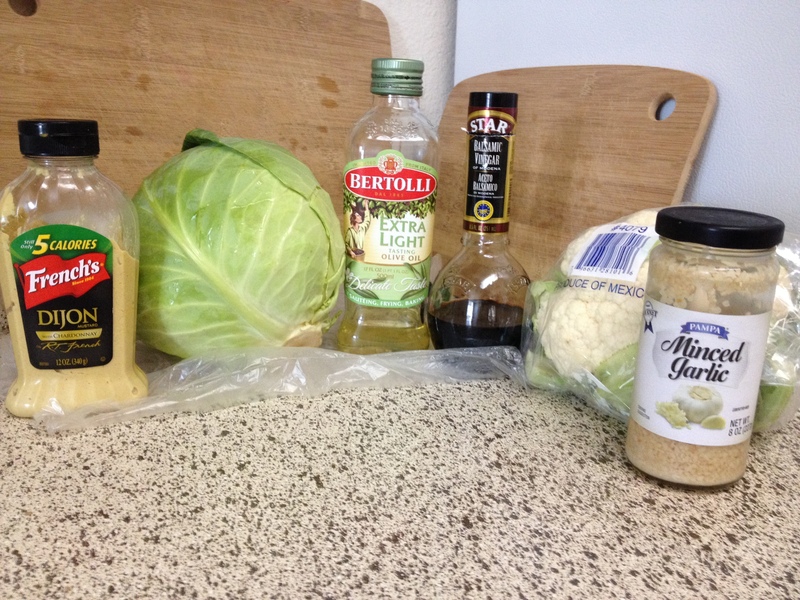 Carefully chop the cabbage into quarters then each quarter in half. Place in bowl and toss, then add more and toss. Cover bowl with saran wrap and let sit in fridge for two hours. Bake at 400 degrees for 25 minutes. These don’t need long to crisp up – my cauliflower and cabbage were both on the small side, if you want crisper add minutes. So, let me also caution you. You may notice that I did not use foil or parchment paper…Well, I ran out of parch, and told myself over and over to line the pan with foil. 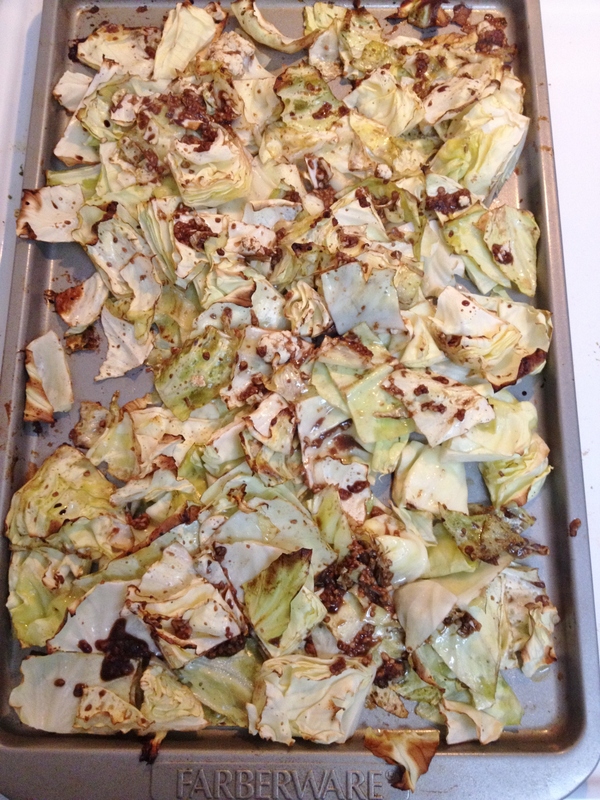 Well I forgot and ended up losing a baking sheet in the burning process – but crispy cabbage is awesome tasting. It tasted nutty and caramelized the sugars in the vinegar and Dijon. 1. 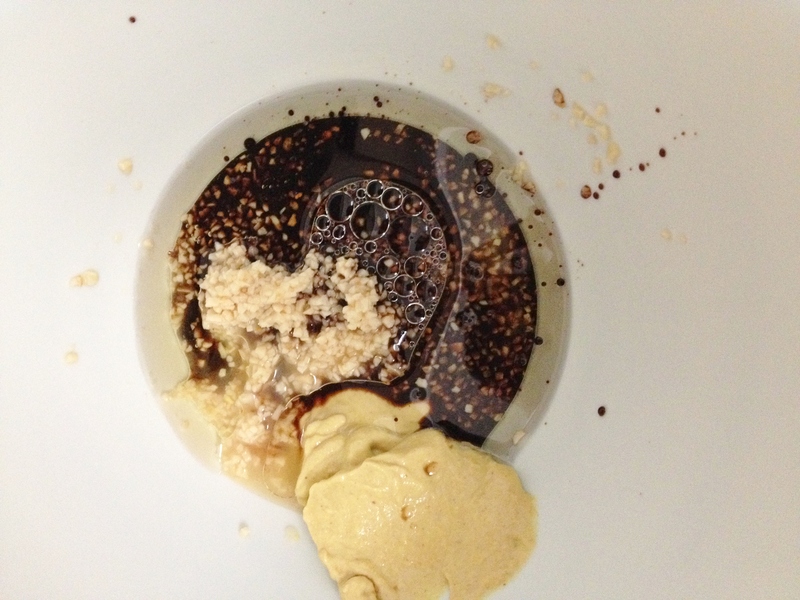 In bowl add oil, vinegar, mustard and garlic and mix. 2. 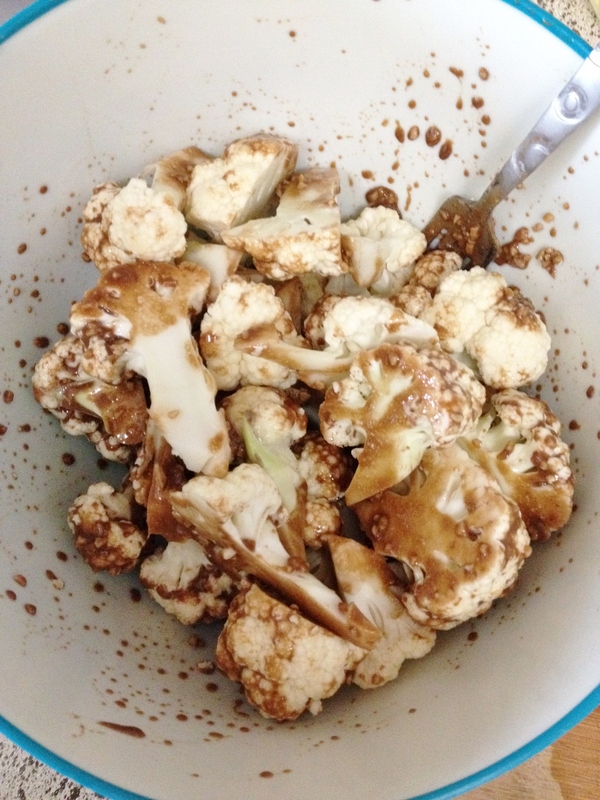 Chop cauliflower and add to bowl and mix. 3. 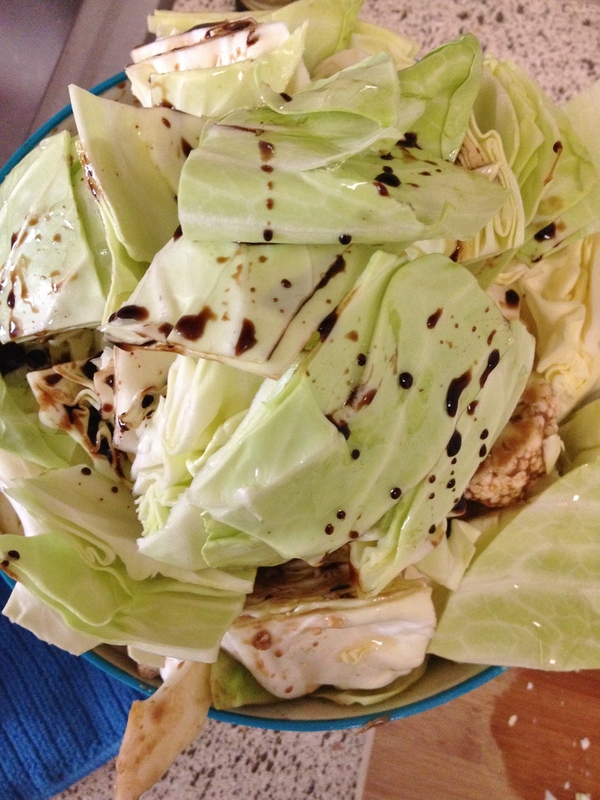 Chop cabbage into quarters, then each quarter in half. Add to bowl and gently toss. Wrap bowl in saran wrap and let sit in fridge for two hours. 4. Turn oven to 400 degrees. 5. Line baking sheets with foil or parchment paper. 6. Pour veggies on sheets. Spoon left over marinade over the cabbage that didn’t get coated. 7. Roast for 25 minutes, or more for desired crispiness.